Banana bread pudding with buttered rum sauce is the perfect make-ahead dessert for entertaining. 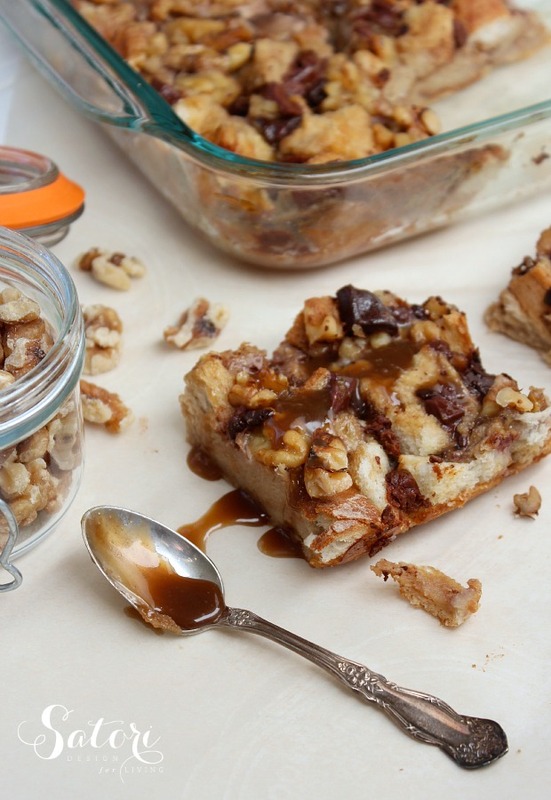 A delicious way to use up stale bread and some overripe bananas. Well, hello there! I’m excited to finally share a baking recipe with you today after being without an oven for such a long time over the course of our kitchen renovation. Go and give your range a hug right now, and kiss your sink while you’re at it. I will never take either of them for granted again! One of the things I missed most during the renovation process was being able to putter around the kitchen on a Sunday afternoon making cookies or muffins or other sweet treats. I’m pretty sure my husband and son missed it too! The smell of chocolate or cinnamon, the warmth of the oven on a chilly fall day and the sight of baked goods as they cool down on the countertop… There’s something comforting about it all, isn’t there? What makes it even better is when the recipe is as simple as this decadent banana bread pudding with chocolate chunks and buttered rum sauce. Chances are, you already have these ingredients on hand, which means you don’t have to wait until Sunday dinner to give it a try. Your family will thank you for the unexpected weekday treat! Preheat oven to 350 degrees. Generously butter a 9 x 13 pan and set aside. In a large bowl, mix eggs, milk, vanilla and sugar until smooth. Layer bread on the bottom of the pan, followed by the bananas, nuts and chocolate chunks. Pour the wet mixture into the pan making sure to evenly coat the bread. Press down with a spoon and let rest for 5 minutes until most of the liquid has been absorbed by the bread. Bake for 45-50 minutes until the top is golden brown and the egg mixture is set in the middle. Allow to cool for a bit before serving. Top with buttered rum sauce (optional). Pour sugar into a heavy saucepan over medium-low heat and stir with a whisk until it starts to break down into very fine granules. Add butter and stir until completely melted and bubbly (about 2 minutes). Stir in rum. Slowly pour in heavy cream until it comes to a boil, stirring constantly. Remove from heat and allow to cool 5 minutes. Pour over bread pudding just before serving. Note: Although the rum flavour in this sauce is subtle, it can be eliminated completely if desired. Although the rum flavour in this sauce is subtle, it can be eliminated completely if desired. More of an apple person? 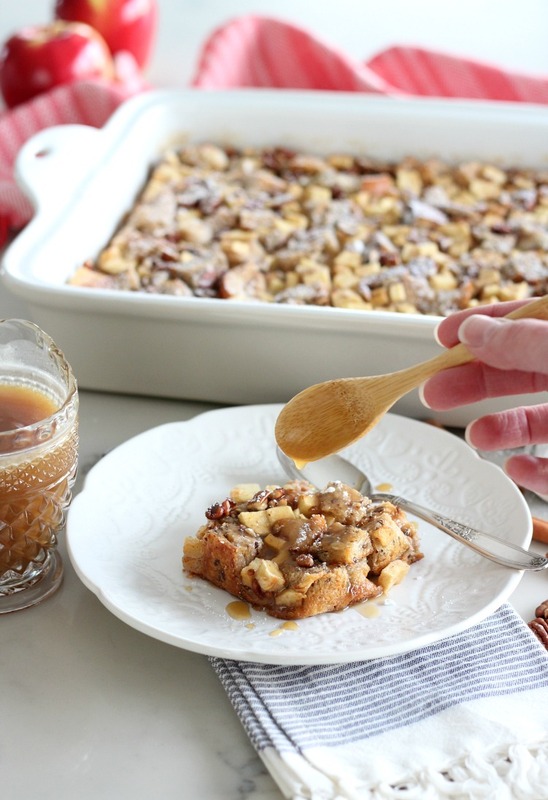 Try this Apple Cinnamon Multigrain Bread Pudding. So good topped with salted caramel sauce!